This new planning calendar was designed for when you want to see multiple months on a single page but still have some room to write notes about the events you are planning. It's great for project planning, sports schedules, clubs, scouts, organizations, and personal goals. 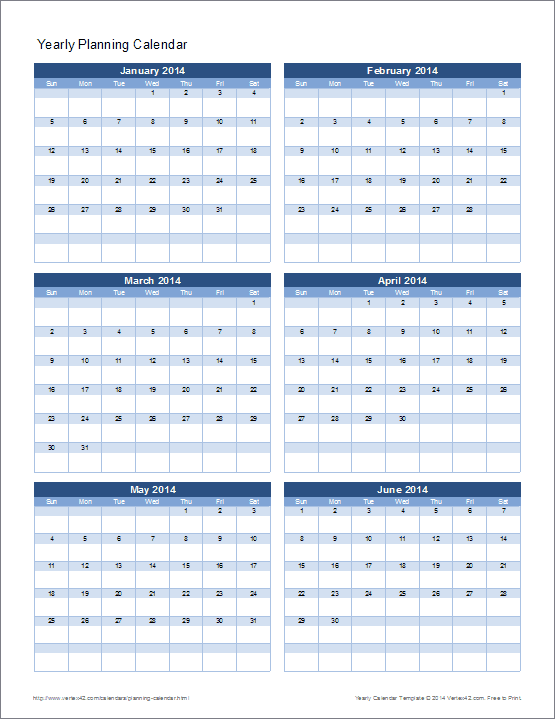 This spreadsheet is a cross between a yearly calendar and a monthly calendar, showing 6 months per page, with two empty cells under each day of the month for including notes. The template was mainly designed for printing, but you can also create your calendar in Excel, merging cells to show multi-day events, adding your own custom color coding and doing everything else that the spreadsheet software allows you to do. When you are done editing the planning calendar in Excel, you can save it as a PDF to share with your organization. Or, you can share the file privately (see the license agreement) so that your team or other group leaders can collaborate and edit the document together. The workbook contains two different worksheets for printing a 2-page, 12-month calendar in either landscape or portrait orientation. 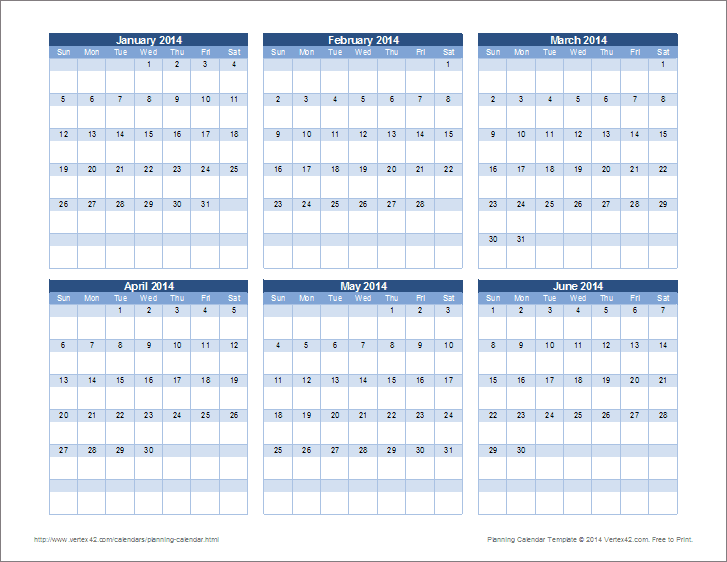 You can customize the calendar to start with any year, month, and day of the week. For example, to create a planning calendar for a school year, you can start the calendar in August. This template was developed based on a request from one of our users who was trying to insert extra rows into a yearly calendar. It seems obvious now that something like this would be useful, so you can thank our visitors for providing great suggestions.